Researchers at the Emotion Regulation Lab focus on a fundamental question: what role do emotions play in mental health? Although often delving into new territory, our main threads of research are anxiety and stress, attentional biases in anxiety and substance-related problems, emotion regulation, digital mental health and the impact of technology on social-emotional well-being, and parent-child relationships across cultures. Anxiety disorders are the most common mental health problem, one that almost 100 million Americans will struggle with over the course of their lives. A primary goal of our lab is to build understanding of the etiology and effective, affordable prevention and treatment of anxiety and stress-related problems across the lifespan. 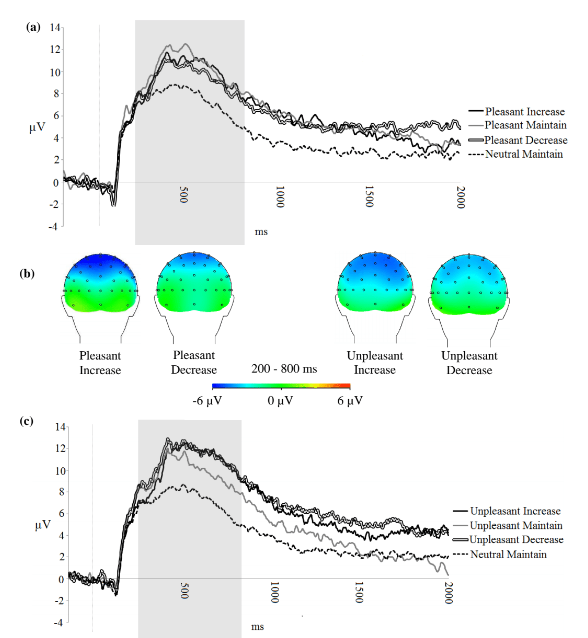 Neural signatures of the anxiety-related threat bias: Assessment and treatment implications. Current treatments are ineffective for over half of people suffering from anxiety. We study alternative treatment approaches that tightly target novel cognitive processes and mechanisms in anxiety. One such mechanism is threat bias, or the mental habit of attending to and preferentially processing threats, real or imagined. In a series of studies, we have examined how the threat bias is expressed on the neural (Dennis & Chen, 2007a, b; Dennis & Chen, 2009; Egan & Dennis-Tiwary, 2018; Dennis-Tiwary, Egan, et al., 2016) and behavioral (Dennis, Chen, & McCandliss, 2008; Egan & Dennis-Tiwary, 2018; O’Toole, DeCicco, Hong, & Dennis, 2011) levels, including how variability in threat bias over time is sensitive to stress and varies with anxiety (Egan & Dennis-Tiwary, 2018) and how changes in neural indices of threat bias predict response to attention training interventions (O’Toole & Dennis, 2012; Dennis-Tiwary, T. A., Denefrio, S., & Gelber, S., 2017). Variability in attention to threat is associated with greater anxiety and stress reactivity. From Egan & Dennis-Tiwary, 2018. Capturing the temporal dynamics of threat bias. We further examine how information about threat can both facilitate and disrupt key aspects of cognitive control among anxious individuals (Birk et al., 2011; O’Toole, DeCicco, Hong, & Dennis, 2011) and how neural signatures of threat processing predict anxiety symptoms over time (O’Toole et al., 2013). In addition to theoretical implications for anxiety, findings are relevant for understanding the nature of emotion-cognition integration (Blair & Dennis, 2010; Dennis, O’Toole, & DeCicco, 2012) and directly inform our research on digital mental health and attention bias modification training techniques. Traditional treatment approaches for anxiety, such as selective serotonin reuptake inhibitors and cognitive behavioral therapy (CBT), have demonstrated efficacy, yet many obstacles exist to their wide scale use, including side effects, high cost, and high remission rates (~70% for first-time treatment). Using Personal Zen for a month reduced biological stress reactivity measured via cortisol. From Dennis-Tiwary et al., 2017. Testing the efficacy of the mobile stress-reduction app, Personal Zen. Computer-based attention bias modification training (ABMT), which is brief, cost-effective, and easy to administer, addresses these barriers. We are among the few labs testing the efficacy of gamified ABMT and have developed an evidence-based smartphone app (iOS) called Personal Zen that harnesses ABMT techniques to reduces stress and anxiety in individuals who play it briefly or regularly. The app is currently available on the iTunes store and has been reviewed by PsyberGuide.We have published several studies (Dennis-Tiwary, Egan, et al., 2016; Dennis & O’Toole, 2014) documenting anxiety-and stress-reduction effects of Personal Zen in adults along with biobehavioral factors underlying its effects. In a recent randomized clinical trial (Dennis-Tiwary, Denefrio, & Gelber, 2017), using Personal Zen for a month reduced subjective anxiety and stress reactivity in pregnant women, including the stress hormone cortisol. Ongoing studies examine how to boost the beneficial effects of Personal Zen to better personalize treatment. Using Personal Zen for a month reduced anxiety-related attention bias in pregnant women. From Dennis-Tiwary et al., 2017. Greater preferences for communicating via devices was associated with neural signatures of less effective emotion regulation. From Babkirk et al., 2015. Despite recent claims that smartphones have psychologically destroyed a generation of Millennials and fueled the epidemic of teen anxiety and suicide in the United States, research on this topic is in its infancy, and much more needs to be known before such causal claims can be made. Your brain on digital technology. 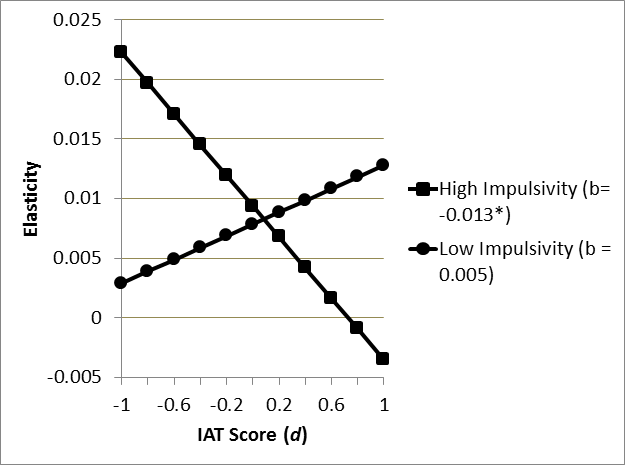 In pursuit of this goal, we developed a questionnaire focusing on preferences and beliefs about computer-mediated communication (CMC) use (Babkirk et al., 2015) and have showed that a greater preference for CMC predicts reduced size of and satisfaction with social support, as well as greater neural signatures for negative emotional reactivity and reduced emotion regulation. Greater habitual use of mobile devices by mothers outside the lab predicted less emotional recovery in infants after an emotional challenge. From Myruski et al., 2017. Parents, put down your devices. In other research, we developed a novel modification of the classic Still Face paradigm (Myruski et al., 2017). We showed that when mothers used devices in front of their infants and toddlers, children expressed more distress and explored less during play. 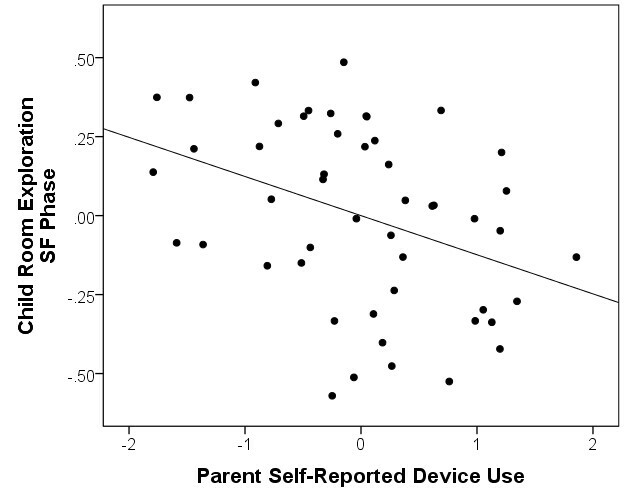 Moreover, greater habitual use of mobile devices by mothers outside the lab predicted less emotional recovery in infants after an emotional challenge. 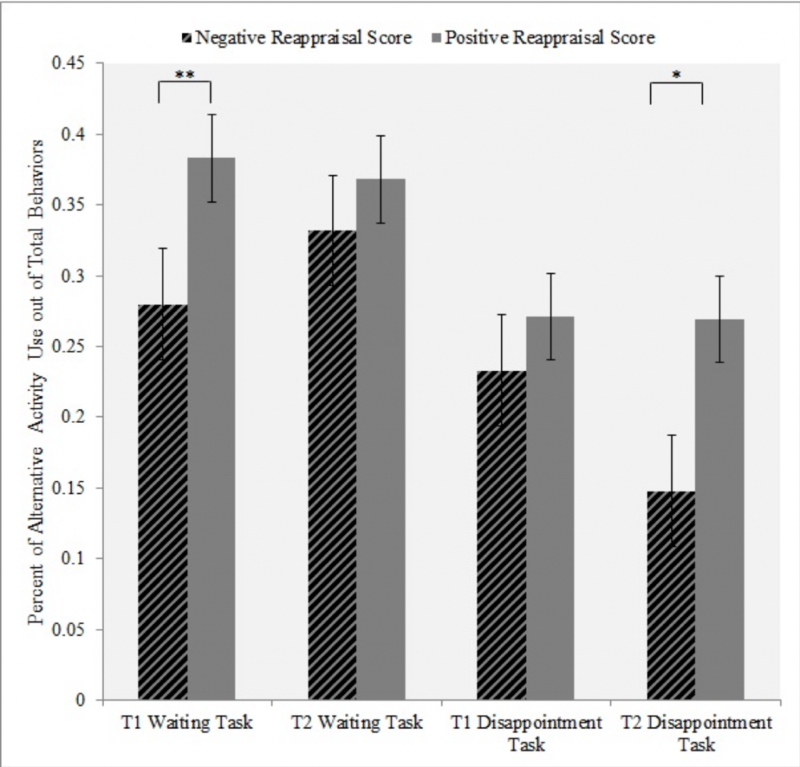 This is some of the first evidence that confirms many of our intuitions: that, like other for forms of maternal withdrawal and unresponsiveness, mobile-device use can have a negative impact on infant social-emotional functioning and parent-child interactions. Neural signatures for emotion regulation predict adaptive and maladaptive emotion regulation in children. From Babkirk, Rios, & Dennis, 2014. Every day we face emotional challenges – whether it’s a stressful work or school experience, needing to wait for something we want, or a personal loss or threat. Our emotions are necessary tools for adapting to these challenges, but can also get in the way and lead to problems including mental illness. The concept of emotion regulation (ER) helps us understand how emotions help or hinder our ability to lead happy and healthy lives. Clinically-relevant neurocognitive markers for emotion regulation. We have identified neural biomarkers for emotion regulatory competence and vulnerabilities, such as EEG asymmetry and scalp-recorded event-related potentials (ERP). 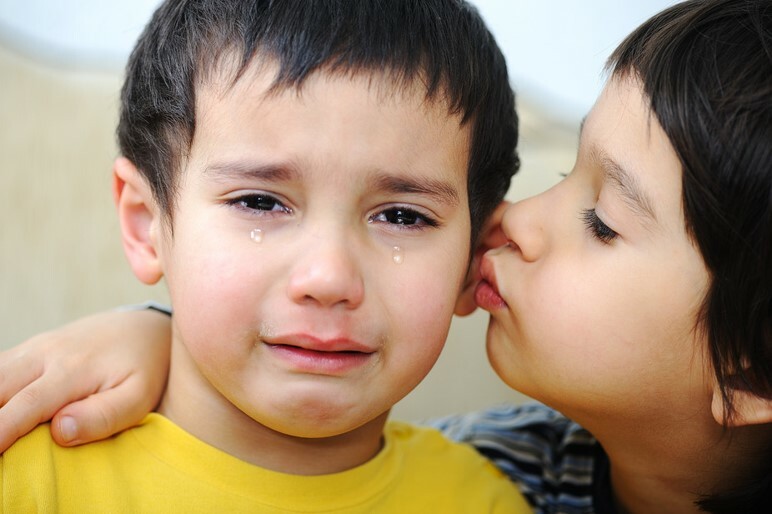 For example, we have used the late positive potential (LPP) to track emotion regulation abilities in children as young as five years of age (Dennis & Hajcak, 2009; Hajcak & Dennis, 2009; DeCicco, Solomon, & Dennis, 2012; DeCicco, O’Toole, & Dennis, 2015). Such ERPs are developmentally sensitive, and can be used to predict emotion regulation adjustment and behavior in children (Babkirk, Rios, & Dennis, 2014; Dennis, Malone, & Chen, 2009; Myruski et al., 2017) and adults (Dennis & Solomon, 2010; Myruski, Bonanno, & Dennis-Tiwary, 2017) and to predict cognitive control capacities (Buss et al., 2011; Brooker et al., 2011). Neural signatures of emotion regulation in adults predicts emotional flexibility and emotion regulatory capacity. From Myruski, Bonanno, & Dennis-Tiwary, 2017. As problems with substance dependence and abuse skyrocket, new evidence-based intervention approaches are needed. We examine the role of novel cognitive factors in problematic drinking, with the goal of developing more targeted and effective treatment approaches. Poor self-regulation combined with stronger implicit thoughts about alcohol led to more drinking among those at-risk for problem drinking. From Luehring-Jones et al., 2016. Cognitive biases predict alcohol consumption in problem drinkers. Using methods from behavioral economics, we found (Luehring-Jones et al., 2016) that poor self-regulation combined with stronger implicit and automatic thoughts about alcohol led to more drinking among those at-risk for problem drinking. Mechanisms in attention bias modification for problematic alcohol consumption. Targeting these processes, in another study (Luehring-Jones et al., 2017) we tested an attention bias modification (ABM) technique for reducing problematic alcohol consumption in young adult drinkers with a focus on examining mechanisms underlying efficacy. 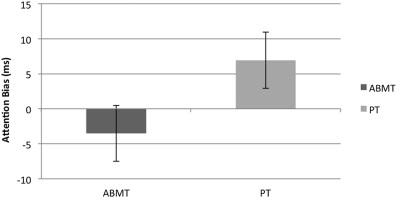 ABM resulted in significant differences in measures of implicit alcohol-related cognition, alcohol-related AB, and self-reports of alcohol craving. 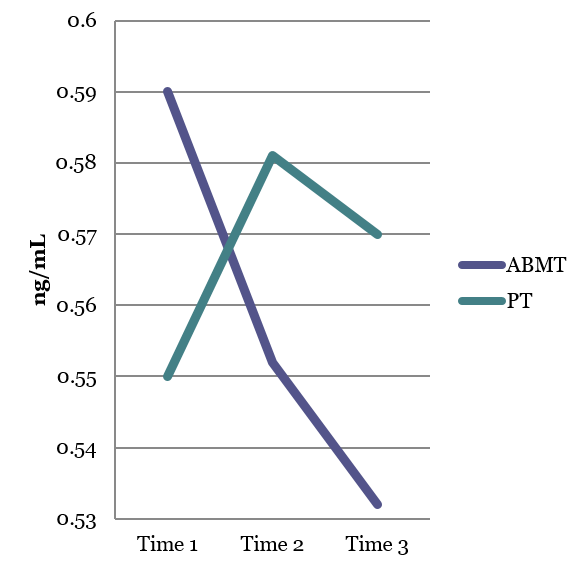 Reductions in craving were fully mediated by ABM-related reductions in alcohol-Stroop interference scores, suggesting a previously undocumented relationship between the two measures. Results document the efficacy of brief ABM to reduce both implicit and explicit processes related to drinking, and highlight the potential intervention-relevance of alcohol-related implicit cognitions in social drinkers.